According to the National Institute on Aging, people are living longer; the average life expectancy for an American female is 81 years and that of an American male is 77 years. As we age, our quality of life doesn’t necessarily have to diminish. Aortic stenosis, is a common heart condition in the elderly population. Unfortunately, a lot of people with this condition are unaware, because they fail to recognize the symptoms. We caught up with Dr. Luis Dibos, The Chief of Cardiac Surgery at Bayfront Health Port Charlotte, to shed light on this valvular disorder. Q: What exactly is Aortic Stenosis and how common is it? A: Aortic stenosis is narrowing of the aortic valve, compromising the outflow of blood from the main pumping chamber of the heart. The most common cause, especially in patients older than 70 years, is degenerative aortic stenosis. This is the gradual buildup of calcium on the aortic valve leaflets, restricting their ability to fully open. For patients younger than 70, bicuspid Aortic Stenosis is the most common cause. This means that patients are born with two aortic valve leaflets instead of three, causing predisposition for earlier calcium buildup on the valve leaflets. The most common symptom is shortness of breath with activity. Unfortunately, a lot of elderly patients think that this is a normal process of aging, and do not seek medical attention. Patients can also develop chest pain with exertion (angina) or fainting spells (syncope). As the aortic valve becomes more and more narrow, the muscle of the heart increases in thickness (known as left ventricular hypertrophy), to be able to generate enough pressure to force blood through the small opening of the aortic valve. This works to compensate for a while, but eventually, the heart muscle will fail, leading to severe symptoms, congestive heart failure, and ultimately, death. In fact, in patients who have symptoms of shortness of breath and have severe aortic stenosis, the average life expectancy is less than 50% at two years. In the United States, about one in every eight people over the age of 70 has moderate to severe aortic stenosis. The incidence increases with age. A: The gold standard for treatment of symptomatic, severe aortic stenosis, is surgical replacement of the aortic valve. 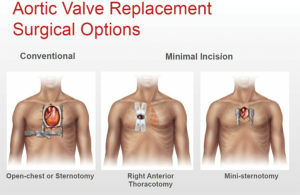 The replacement options are either a mechanical valve, which is usually reserved for younger patients, or tissue valves (pig or cow valves). The advantage of the tissue valves or bioprosthetics, especially in the elderly, is that there is no need to take lifelong blood thinners. The surgical procedure has improved dramatically over the last 10 years. We use a rapid deployment valve, which cuts down on the operating time significantly. This, of course, is better for the patient. Under general anesthesia, a 3 to 5 inch incision is made over the breastbone, and the heart and lung machine circulates and oxygenates the blood, while the surgery takes place. The old damaged valve is removed, and replaced with a new valve. The patient is then taken off of the heart and lung machine, and the chest closed. The whole procedure takes roughly 2 and a half to 3 hours. Once the aortic valve is replaced, life expectancy improves dramatically. Average five years survival after uncomplicated valve replacement is around 75%, and the median survival for patients older than 70 is around 11 years (much longer than with medical treatment). 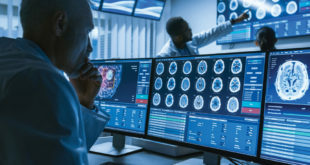 For patients who are deemed too high risk for surgery, or inoperable, after evaluation by a Cardiac surgeon, a newer procedure, called Transcatheter Aortic Valve Replacement (TAVR), is available. This works in much the same way as deploying a stent into an artery. Through a catheter inserted in the groin, a new valve is placed inside the patients native aortic valve, and expanded, pushing the old valve leaflets out of the way. Q: What is the one thing you want these patients to know? A: It’s not too late. Don’t ignore your symptoms. Listen to your body. You do not have to succumb to a poor quality of life even at the age of 80. The procedure, in the right hands, will change your life, increase endurance, and increase your survival dramatically. If you are experiencing shortness of breath, chest pain, or fainting spells, do not wait; schedule an appointment with your doctor or go to the emergency room immediately. Dr. Luis Dibos is a cardiothoracic surgeon who comes to the Southwest Florida Heart Center at Bayfront Health Port Charlotte from Baltimore, MD. He has a special interest in minimally invasive valve repair and replacement, stentless aortic valve replacement and beating heart surgery. He performs 70 percent of his coronary artery bypass operations without the use of the heart-lung machine (off pump). Since 1996, he has performed more than 6,000 cases and been involved in more than 150 TAVR procedures. To schedule your appointment or to find out more, please call (941) 300-1461 today.